Home → Blog → Which Is Cheaper to Run, an Electric Fireplace or a Gas Fireplace? 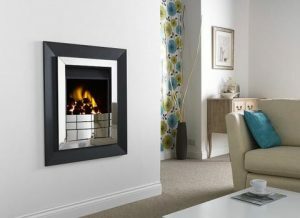 If you’re lucky enough to find yourself at the exciting stage of choosing a new fireplace as part of the refurbishment of a living space or reception room, it’s likely that you’re quickly realising just how many options are available to you – not only in terms of look, but also when it comes to fuel sources. For many modern homes, the lack of a chimney or flue and the expense and effort of creating one makes many people lose hope that they’ll ever be able to install a beautiful fire of their own. However, wood and coal burning fires and stoves are far from your only options – with a multitude of gas and electric models on the market, you can go chimney free and still enjoy a beautiful new fixture that will add beauty and warmth to your home. Choosing to install a gas or electric fire as a feature will not only increase your enjoyment of the space in with you live – it can also help to increase the value of your property. But which is cheaper – gas or electric heat? 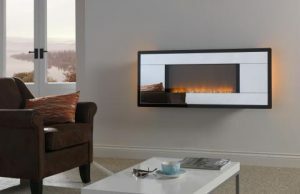 Here, ELB fireplaces will compare the two to help you make your decision. Gas fires have been popular for decades, something that shows little sign of abating. However, many people don’t realise that their home doesn’t need to run on gas in order for them to have a fireplace of this kind. Liquid Petroleum Gas (LPG) can easily be purchased and piped in from outside to fuel your fire, as long as you have somewhere secure to store it. But how expensive is this option, and how much would it cost to run a fire off an existing gas supply if you have one? Buying in LPG is, of course, cheaper if you purchase in bulk. If you buy a kilogram of bottled gas, it should cost you around 6p per kWh of output. Using gas from an existing mains supply should cost you about the same, so you won’t miss out in any way if your home doesn’t have this option. Overall, a gas fire of either kind should cost you just over £45 annually to run on average, excluding the cost of installation. Compared to the gas option we’ve just discussed, are electric fires expensive to run? The answer is no – in fact, they’re actually usually much cheaper, coming in at around £20 per year on average, which is less than half the cost of gas. They’re also relatively easy to fit and can run off your mains supply, meaning that installation is often much easier and cheaper than that of an LPG fuelled model too. While the benefits of electric heating are great, there are a few downsides – the main one being that they don’t let off as much heat as their gas-fuelled alternative, so many people still consider opting for a gas fire to be the better option, despite the additional expense. One of the great things about gas fires is that they can be flueless – meaning you can fit them with ease without requiring any kind of chimney – so they’re suitable for almost any household. They’re also both relatively environmentally friendly, as gas fires release fewer pollutants than traditional coal or wood, and electric options release nothing at all. Electric fires are safer for households with children too, as they’re cool to the touch. There are a great many visual styles available for both types of fire, depending on your preference. Flame effect fires can give a natural, more traditional feel to a space, but both gas and electric options are capable of great variety – so it’s possible to choose from an almost endless selection of designs to suit any home, however classic or modern their interior style. ELB Fireplaces offer a wide range of options within our selection of electric and gas fires. We also stock a great many wood and coal burning fires and stoves, so you can take your pick of beautiful heating options, whatever the requirements of your home. Contact us today via our handy contact form for further information, or visit our showroom at 70 Twist lane, Leigh, Lancashire, WN7 4DP to take a look at our range in person.